Patrick and Alex Lawson want you to say hello to their little friend. Damn we need an edit function! I've never been a fan of "Scarface" and freakin' LOVE DePalma. I've seen the film 4 times and the last time I watched it I tuned out everything and only concentrated on the filmmaking. It's good but it's not the DePalma greatness that he had already shown in at least 8 films before. Maps to the Stars is a strange one. I actually think I like it after sitting on it for a few days. It's essentially showing how "ugly" people in Hollywood are and I'm cool with that. I disagree with the fire effect, I think the special effect fakeness was done on purpose. I think the whole movie is shitting on the way Hollywood is and Hollywood is littered with huge, epic budgets that end up with bad CGI, therefore, I feel like it was done as a statement to that. I think the same about Julianne Moore's "fart joke" scene. I believe it's an "in-joke" - "look, I got one of the greatest actresses to do THIS!" Just my thoughts, could be wrong. I LOVED Wyrmwood. Thought it was a ton of fun and just the right length. Almost everything people hate about Scarface I love. The violence, the over the topness of it all and yes Pacino's ridiculous accent. I've always kind of wondered if my general dislike of this movie was just me. It's not like I hated this movie last time I watched it, but I was really unimpressed and a little perturbed by al Pacino, which is actually generally my feeling about Pacino as an actor. But I guess my feelings were a little more valid than I thought. Hard to tell when this movie is so engrained in pop culture, so when I finally saw it I expected a masterpiece and got, well not a masterpiece. I first saw the movie about 15 years ago. The funny thing was first viewing of the movie was follow by what appeared to be a huge resurgence of the film. I remember all sorts of merchandise like toys clothing (all of which was tacky) and even a video game which I believe used Pacino likeness but not his voice came out. I did a little research back then and found out that the movie was almost universally hated by critics (broke my heart). Also I believe it was protest by Cubans Americans. The movie is just under 3 hrs and I enjoy ever minute of minute. Great to have you back Alex, congratulations! I love how discussions like these show how great Fthismovie is. The way you talk about movies you don't like is still as fun and dynamic as well as respectful to the other's opinion. I very much agree with you two on this one, there just wasnenough of De Palma in this one for me to love it and I have only seen it once. Just heard this podcast. 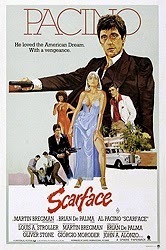 I Like Scarface very much since I saw it in on the big screen in 1983, although I agree with most points of critique you mentioned. They just don´t rubbed me that much. Sometimes it´s good to see the movie dubbed in german, because most of the ridiculous accents were erased through the dubbing in the german version, so you don´t even notice that Robert Loggia or F. Murray Abraham are playing Cubans, except for the characters names and the tan. Yes, it`s more a strange Stone/De Palma hybrid than a genuine De Palma movie, but i still like it very much and, as you both said, it´s immensely watchable.